Marge and Dave Randles at Argyle Cheese recently won the Washington County Small Business Award for all the hard work and progress they have made in the past six years. Marge and Dave not only make many different types of cheese, but also milk, yogurt, greek yogurt, cheesecake, gelato and ice cream! 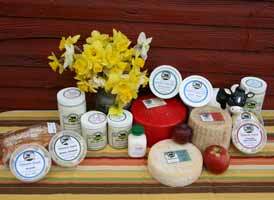 All of which can be bought at the farm store front out by the cheese barn or at the Saratoga Farmers Market, which Marge is on the board of. Argyle Cheese is the epitome of local. Dave and Marge use raw materials not only from their own farm, but from their neighbors as well. They sell their products at the Saratoga Farmers Market. When produce gets shipped beyond the local area, Marge and Dave, rather than using their own means of transportation, reduce their carbon footprint in whatever way they can – either using already established delivery channels, or letting their produce hitch a ride down to Manhattan with another farmer who is going down that way already. The best part about this job, Marge says, is the smile it brings to a person's face – tasting real milk for the first time, or having that first spoonful of tangy, fresh, yogurt. And being present when that moment occurs either at their own store front, or at local farmers markets. But what she likes doing best, when she isn't working long hours – she mentioned her longest days were from 3:30 AM until 7 PM – is starting on new products. Whether it's the cheesecakes or gelato that have recently been added to the menu or something completely different, she is enthralled by the challenge of turning around the possibility of failure. The best the rest of us local enthusiasts can do is cheer them on, continue to buy local, and hope that Marge keeps turning her experiments into wonderful, yummy new products!